As many people know I have two distinct chapters in my running life. One from about the ages of 18 - 23 where I ran roughly 12 marathons, averaging around 3:45 before then taking 8 years away from running. In 2015, very unfit, not in great health and in a bit of a mess with life I gave running another go to get my life back on track and naturally turned to running to turn things around. 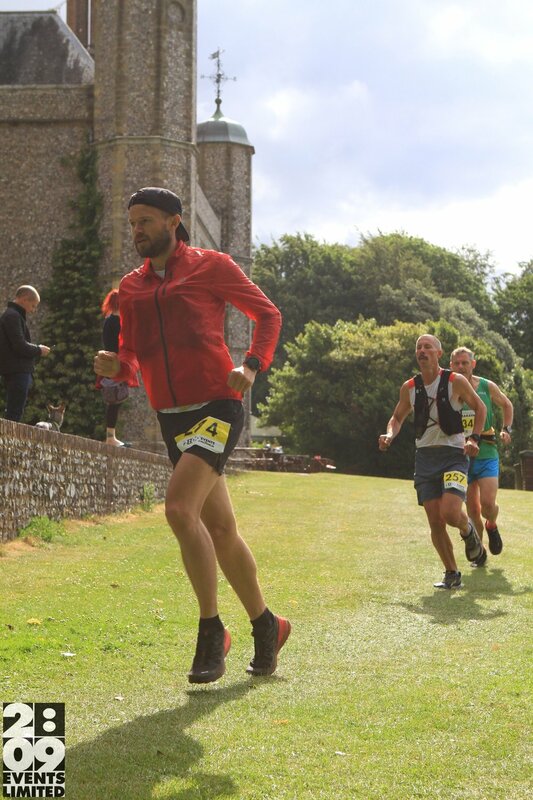 The 2015 South Downs marathon was one of my early races back then and my first real attempt at running on trails, so it was a big learning curve. It was a tough race for sure and I crossed the finishing line in 3:59:58.. that was quite a sprint for the line to break 4 hours! It’s always very odd returning to races, with all the knowledge, fitness and experience I have now. But it really goes to show me how far I’ve managed to come in a relatively short period of time. I'd secretly got it in my head that I'd try and beat my 2015 by an hour and come in sub 3. Judging my previous years results that would give me a good chance of getting on the podium and mentally a big boost with my trail running. It was cold on the start line, so jacket over pack was the only option! The first 7k is mostly uphill and I set off with the lead pack, that had around 4 of us in it. Some of the early pace setters dropped off quickly as the vertical kicked in. I’d chosen to take a Salomon pack so I didn’t have to stop at any of the aid stations, I could carry enough water for the race and take my own nutrition. When I breezed through the first one without stopping I knew it was a good call, saving valuable time and it’s always best to have your own fuel sources on board that work for you. Head to toe in Salomon! 5k came up in 20:34, the next 5k in 21:52, then 21:23, then 19:54. Given the big changes in elevation it’s hard to read much into this, but it was consistent and my heart rate was averaging 160 for the first half, so I knew I still had plenty in the tank if I needed it. Don't take photos at the top of hills, everyone looks awful!! Haha.. The lead pack had dropped down to two now. I'd mapped out the big climbs before, so knew exactly when to take my gels so they’d hit my system in time for the hills. I took 4 in total, the same as a road marathon, but had some Maurten drink in my bottles as well. I grabbed a couple of waters from the aid stations, that I could run with quickly, so all in all it made for a pretty efficient strategy. It worked surprisingly well, I never felt tired, no stomach issues, really happy and one I'll be using again. All the data is on Strava! The 20-35k splits were 22:06, 22:02, 21:38 again nice and even. I was beginning to lose sight of the leader now, he was just that little bit stronger on the hills than me and in hindsight I probably had more to give, but didn’t want to throw away what was looking like a strong performance and go for glory, in what was only ever a training race run. Giving it the beans on the final descent.. Hitting 40k in 2:51:37 I knew I’d have to give it some to get in under the magic 3, but cracked out a 3:37km on the downhill stretch into the park, which meant I could enjoy the finish. It was hard to tell exactly where the third place runner was as we were finishing with all the half marathon runners, so there was a sea of people around, but there was certainly no one catching as far as I could see. Crossing the line in 2:58:57, an hour and one minute faster than 2015 was an incredible feeling. It was the first time I’d really put in a performance on trails I was happy with, I ran strong from the off, hit my A goal and finished fresh with more to give. Next stop Verbier for the St Bernard 73k / 4000m+. Time to have some fun in the mountains! A big well done to all the runners out there on the Downs, it was nice to meet some of you afterwards. If you haven't done this race before then it's a great introduction to trail running for sure, the half is a great route as well, so look out for it in 2019. Thank you for all the messages of support and following along, it's very much appreciated. It all adds up to make a real difference, so can't thank you enough!